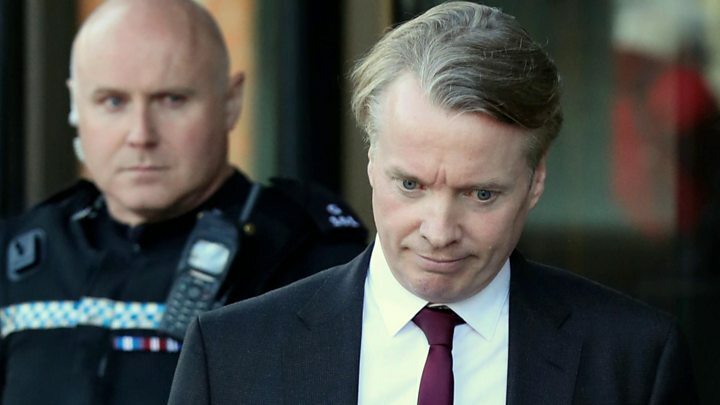 Craig Whyte has been cleared of fraud but that "doesn't exonerate him from his villainy towards Rangers Football Club", according to Alastair Johnston, the man who was chairman of the Glasgow club at the time of its sale. In an interview with BBC Scotland, Johnston said: "Candidly he should have been charged with murder, murder of an institution. "Destruction of people's passion, destruction of the spirit of hundreds of thousands of Rangers' fans. That's what he should have been charged with. Then it would have been a no brainer." Prosecutors, instead, charged Whyte with fraud relating to his takeover of the club in May 2011 and a jury acquitted him. He may have lied his way into Ibrox, concealing the true nature of how he was funding the takeover and his entrance signalled the beginning of the financial collapse of Rangers but his behaviour was not considered criminal. Craig Whyte was the only man to face a jury but does he shoulder sole blame for the humbling of a great Scottish institution? Back in 2006, Sir David Murray, who had been in charge of Rangers for 18 years, said: "If I move on from Rangers I will leave it in the hands of people who I think have the best interests of the club." Two years later the financial crash of 2008 brought the Bank of Scotland to its knees and it had to be rescued by Lloyds Banking Group and the British taxpayer. Once Lloyds got a peek at the Scottish bank's lending book to some of its more high profile customers - chief among them, Sir David - they got a shock. The crash had left the Murray Group exposed to his new bankers to the tune of almost a billion pounds. Lloyds, believing the previous lending to Murray had been reckless, set about dismantling his empire in a bid to recoup the losses. Ian Fraser, the financial commentator who has reported on Murray's businesses extensively, told the BBC: "Rangers was the beginning of the workout of his business empire. "In the end of the day, in what must have been a massive humiliation for David Murray, he was no longer in command of the situation [and] was basically forced to sell the club." But there was a kicker, as revealed on day eight of the Whyte trial, by Lloyds banker Ian Shanks. "It was always our agreement that he would get [his] Metals [business] if Rangers was sold," Shanks told the court. Whyte's QC Donald Findlay asked: "Is that not an incentive to sell Rangers?" Humbled by the colossal debt and desperate to hold on to whatever parts of his crumbing empire he could, Murray sold the club to Whyte. Simply put, Whyte was the only show in town. And Murray had been told he would get his metals business back if he sold Rangers or paid off the debt. The only thing is, Murray group didn't declare this apparent benefit to the independent board of Rangers charged with scrutinising the takeover, according to its chairman, Alastair Johnston. In a wide ranging interview with the BBC, Johnston said: "One of the things that became very important to the independent board…that if indeed there was any other consideration…other benefits that would be there in, in any form, whether it's from the buyer or whether it's from the bank, that that needed to be disclosed." Johnston, whose primary role within the independent board was to represent the minority shareholders of Rangers during the takeover, said he was "shocked" when he heard the evidence of Ian Shanks from Lloyds. He said: "I didn't think that the incentivisation was so material, was so fundamental. "That's definitely something if we'd known about it, we would have absolutely felt an absolute…responsibility to declare." But Johnston and the rest of the board had sought - and received - assurances from Murray's companies, that he believed were sufficient to show Murray was receiving no side benefits from the deal. "There is no additional benefit, financial or otherwise, to MHL (Murray Holdings Limited) as a result of this transaction … and no change in the existing arrangements between MIH (Murray International Holdings) and its subsidiaries and LBG (Lloyds Banking Group) …"
Asked if he had not raised concerns about potential side benefits to the minority shareholders because of this letter, Johnston answered: "That's right." Was Johnston misled by Murray? Johnston told the BBC: "Oh yeah I feel misled because these guys knew, the bank and the Murray executives, their accountants, their lawyers, they knew why we were asking [for the assurance]. "The answer came back with what I would call technical evasion. "But it prevented us doing the right thing in terms of being as transparent as we could with the shareholders and stakeholders in Rangers Football Club." In a statement, Sir David Murray said he did not accept the assurance provided was misleading. He added: "As part of the restructuring of the Murray International Holdings Group in 2010, it was agreed between myself and Bank of Scotland that Murray Metals Group (MMG) would be owned as a joint venture between the bank and myself. The joint venture would be constituted by me acquiring 50% of MMG for £1. Once this was agreed in principle the bank then required that the transaction should be linked to a sale of Rangers. "However, the bank subsequently required that the conditional sale agreement be treated as null and void and that MMG should be marketed. Following a marketing and competitive auction process … part of MMG was acquired by Barrett's Steel in 2012, and the other part by myself for £13.8m in the same year, which included refinancing the bank debt owed by the relevant part acquired. "The transaction referred to by Ian Shanks therefore did not take place. In any event, even if MMG could have been acquired by me for £1, this would not have acted as an incentive to dispose of Rangers to anyone who did not appear to have the means to fund the club going forward." Who knew about the Ticketus deal? Craig Whyte's nine months as Rangers owner were a disaster from which it has still not fully recovered but in the end it was Whyte's toxic Ticketus transaction in the run-up to the purchase that would land him in the dock. He was charged with fraud because he had raised funds for the takeover commitments by selling three years worth of Rangers season ticket revenues before he owned the club. When Sir David Murray took to the witness box in the fraud trial, he effectively said he was duped and only heard about the Ticketus deal a year after the sale went through. But the jury would hear about multiple warning signs that, due to the incentives made by the bank and a desperation to get the deal done, the Murray Group allegedly ignored. Whyte's defence lawyer Donald Findlay QC told the jury the Murray Group "just didn't care. The deal was all that mattered." The BBC has obtained a note, taken by Johnston six months before the deal went through, which suggests Mike McGill, Murray's close adviser, was aware of the potential of a £15m facility from Octopus, the parent company of Ticketus. Referring to this note in court, Mr Findlay said: "I can't prove Murray group knew about the Ticketus deal. But they ought to have known." Sir David Murray told the BBC: "Any provision of a Ticketus/Octopus facility to the club was to be for working capital purposes, NOT to enable the club to lend money to Craig Whyte to enable him to acquire the Bank of Scotland debt owed by Rangers." He added: "I do not accept that there were any warning signs about Craig Whyte's funding or ability to run the club. We were given undertakings from Collyer Bristow, Craig Whyte's lawyers, which confirmed that the necessary funding was held by them for drawdown by the club as and when required." During the trial it was revealed that Murray Group had failed to spend any money on due diligence on Craig Whyte before the sale. But in his statement, Murray said: "I do not accept that we failed to carry out due diligence on Craig Whyte. Given that he was advised by Collyer Bristow, a reputable firm of lawyers, Saffrey Champness and MCR, both reputable firms of accountants, all of whom were FCA regulated firms, we were entitled to assume that Craig Whyte was a person of good standing." After selling Rangers, the Murray Group was effectively wound up. Murray International Holdings was liquidated with debts more than £200m - but the Murray family had been able to acquire portions of his businesses back, including his property business and MMG, for £13.8m. This year Sir David made a return to the Sunday Times Rich List as the 53rd wealthiest in Scotland. Ian Fraser said: "It's an incredible Houdini-like escape that David Murray has had; it's largely thanks to the British taxpayer. "The taxpayer had rescued Lloyds. He couldn't have carried on funding Rangers as he was, through overdrafts and bank loans, that was going to be unviable. "So he took a hard-headed business decision and opted to sever all ties [with Rangers]. "He has danced to the tune of Lloyds Banking Group, and if David Murray had failed to do that he would not be back in the Sunday Times rich list." Sir David Murray said: "The sale of Rangers has been totally unconnected to the performance of my businesses, not all of which have flourished since 2011. "In particular, MMG, which I acquired largely in order to ensure continuity and to preserve jobs, has struggled since it was acquired…and has only recently (2016) seen a return to profitability." Alastair Johnston said Sir David's Rangers legacy has been damaged. He said: "The lasting memory is of him participating as a material part of its downfall and that, that's not a great record." If the Ticketus deal was a secret, there were plenty who were in on it, alongside Craig Whyte. One name raised frequently during the trial was David Grier of Duff and Phelps. He was Whyte's key adviser during the takeover, and was by his side as Whyte walked into Ibrox for the very first time. In May 2012, in the documentary The Men Who Sold The Jerseys, the BBC alleged David Grier was aware of the controversial Ticketus deal, which had been concealed during the takeover. It was alleged this in turn could have constituted a conflict of interest in his company accepting the Rangers' administration. Greir strongly denied he was aware of the Ticketus arrangements. But the BBC then obtained a series of recordings, which strongly suggested that he was. In a conversation secretly recorded with Whyte in May 2012, Greir appears to admit he did know. The BBC subsequently alleged that Grier attempted to ask Whyte to release a press statement saying that he (Grier) was not aware of the Ticketus arrangements. During the trial, Gary Withey told the court that Grier knew all about the Ticketus arrangements, and also alleged that his role was "with the benefit of hindsight, to get RFC (Rangers) into administration and walk away with millions of pounds of fees". In a letter, David Grier's lawyer said: "Our client had no knowledge as to the financial structure of the Craig Whyte takeover of Rangers. He had no knowledge of the arrangement involving Ticketus. "Can we suggest if you are interested in broadcasting an accurate examination of the takeover that you consider the involvement of others who were actively and intimately involved, namely Messrs Betts, Withey and Saffrey Champness. "The suggestion that our client sought to incite Craig Whyte to lie for him about his knowledge of Ticketus is fanciful. We acted on behalf of Mr Grier in the criminal case. Disclosure ran to many hundreds of thousands of documents, none of which lends weight to this suggestion." The regulatory body, the Insolvency Practitioners Association, cleared Duff and Phelps of conflict of interest claims. Duff and Phelps have a £3m defamation case against the BBC over the allegations, which has been in legal limbo since the start of criminal proceedings. Charges against Grier, Withey, the Duff and Phelps administrators Paul Clark and David Whitehouse were all dropped. But Grier, Phil Betts and Withey were all involved in putting the doomed deal together. They had been allowed in the door by Sir David Murray - who failed to safeguard the club's future. As for Craig Whyte, he might have been declared bankrupt and banned from being a company director but one suspects he will have a few bob tucked away somewhere. He was the only one who faced a jury - and today, they acquitted him. So in the end - everyone walks away.